WASHINGTON—Two U.S. senators from opposite sides of the aisle are proposing legislation that would close a loophole in the Medicaid rebate program that allowed Mylan to save over a billion dollars by allegedly misclassifying the EpiPen. 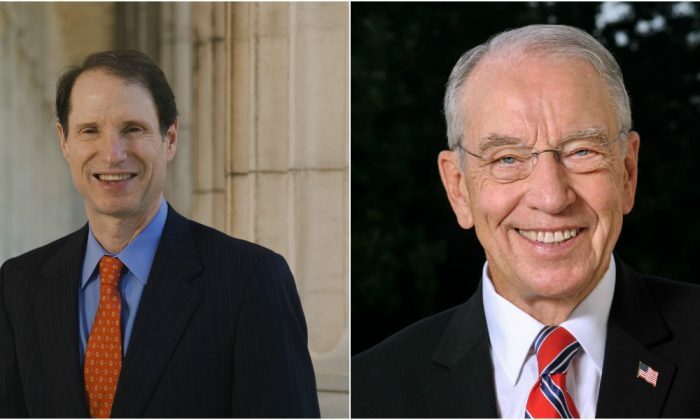 Proposed by Ron Wyden (D-Ore.) and Chuck Grassley (R-Iowa), both members of the Senate Finance Committee, the bill would give the secretary of the Department of Health and Human Services (HHS) the authority to go after misclassifications made by drugmakers. These misclassifications equate to major savings for drugmakers, because rebate rates can be tied to a drug’s classification. Drugmakers joining the Medicaid Drug Rebate Program (MDRP) are required to enter into a contract with HHS that mandates rebates, in exchange for a state putting most of the manufacturer’s drugs on its list of covered drugs under Medicaid. As an example of the potential savings, drugmakers may be asked to send back a mere 17.1 percent of the average manufacturer price for pediatric drugs, versus 23.1 percent for innovator drugs. Currently, drugmakers get to decide into which category their drugs fall, and neither HHS nor a state Medicaid program has the authority to change it. The bill would allow the secretary to reclassify drugs, impose fines, and recover owed rebate payments. In August 2017, Pennsylvania-based Mylan agreed to a $465 million settlement with the Justice Department after the DOJ charged that it had underpaid on Medicaid rebates by misclassifying the EpiPen, used to reverse severe allergic reactions. The DOJ alleges that Mylan classified the EpiPen as a generic, which means that more than one manufacturer makes it, but classified it with the FDA as a brand-name drug, meaning it comes from a single source. Because of different rebate rates for generics, Mylan was able to save an estimated $1.27 billion from 2006 to 2016, according to HHS’s Office of Inspector General. During that time, Mylan increased the price of the EpiPen by about 400 percent. Some 600 drug manufacturers would be affected by the legislation, the number that currently participate in the Medicaid Drug Rebate Program, according to the Centers for Medicare & Medicaid Services (CMS). After announcing the bill, called the Right Rebate Act, on Dec. 4, it has yet to be introduced; Wyden says he’s hopeful to get it passed by the end of the year.